Community Description: Matted evergreen shrubs and a few herbs are scattered among boulders or in bedrock pockets in an open alpine setting. Cushions of diapensia are the dominant feature, and alpine bilberry is typically common as well. The cover of herb species is usually <20%, and graminoids such as Bigelow’s sedge and highland rush are typically more abundant than forbs. Older mats of diapensia may exhibit dieback. Back to top. Soil and Site Characteristics: Sites occur on very exposed and windswept areas above treeline, with plants growing in gravelly substrate among fractured rocks. Slopes are flat to gentle. Back to top. Diagnostics: Diapensia is the dominant species with >20% cover. Back to top. 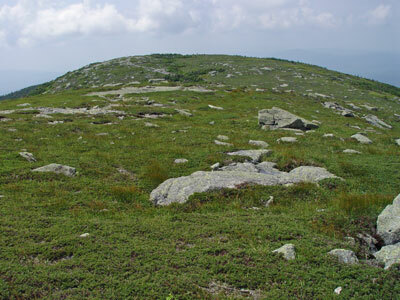 Similar Types: Heath Alpine Ridge can occur at similar elevations and can grade into this type, but diapensia, if present, is sparse (< 20% cover). Alpine Snowbanks similarly lack extensive diapensia. Rocky Summit Heath and Mid-elevation Balds lack diapensia and other strictly alpine species and generally occur at lower elevations. Back to top. Conservation, Wildlife and Management Considerations: This type is restricted even within the alpine zone and is very sensitive to hiker impacts. Because the vegetation is characteristically sparse and often occurs on flats, it is easy for hikers to wander off trail. 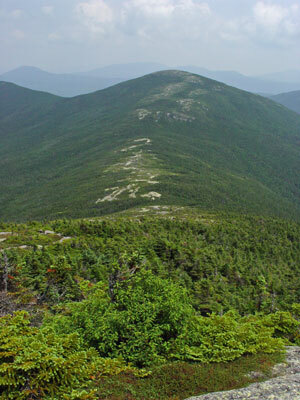 The documented Maine sites occur on public lands or private conservation lands, where hiker impacts are the main management concern. Mt. 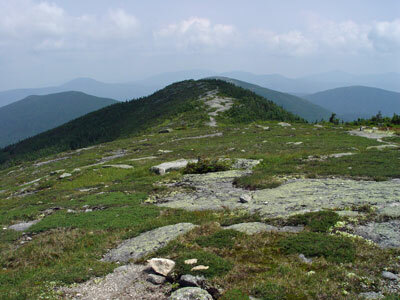 Katahdin is the only known nesting area in the state for the American pipit, which uses a variety of natural community types above treeline. Back to top. Distribution: Restricted to Maine's highest mountains (New England - Adirondack Province), extending west to New Hampshire and along the Appalachians, and possibly northeastward to the Gaspé peninsula. Landscape Pattern: Small Patch. Back to top. Mt. Katahdin, Baxter State Park Piscataquis Co.
Saddleback Mountain, Appalachian Trail Franklin Co.